I am such a huge, huge fan of The Millions, an online magazine covering all things literature. It's one of my favourite websites to visit and get lost in. 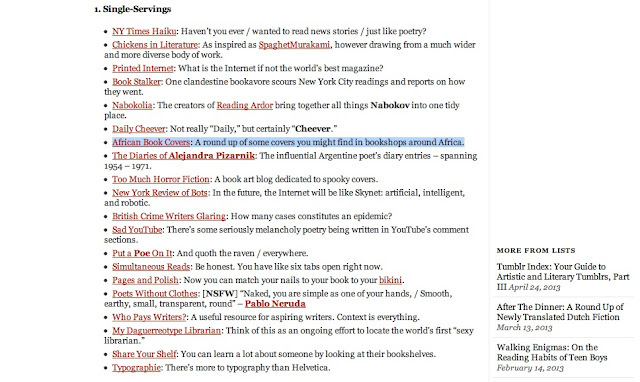 So imagine my shock late last night when I was reading their Guide to Artistic and Literary Tumblrs, Part III and I saw African Book Covers on the list. I was surprised they knew my tumblr existed and really excited that it made it on a list with really cool tumblrs. It's pretty amazing that something I love and enjoy doing gets a mention on The Millions. I have so much fun looking for different African book covers, and always get excited when I find them - whether they are classics or new. Here's to celebrating and appreciating the African book cover, and sharing it along the way. So thank you for the mention Millions. 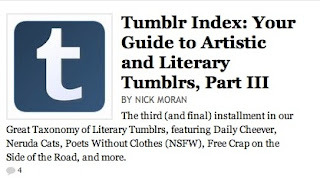 Check out the list and links to all the other Tumblrs mentioned here . If you haven't already, my tumblr, African Book Covers. i just stumbled upon your blog and i think it's amazing! thanks for mentioning 'the millions', i was looking for something like it for quite some time now!